In our increasingly polarized society, there are constant calls for compromise, for coming together. For many, these are empty talking points—for Lucy Moore, they are a life's work. As an environmental mediator, she has spent the past quarter century resolving conflicts that appeared utterly intractable. Here, she shares the most compelling stories of her career, offering insight and inspiration to anyone caught in a seemingly hopeless dispute. Moore has worked on wide-ranging issues—from radioactive waste storage to loss of traditional grazing lands. More importantly, she has worked with diverse groups and individuals: ranchers, environmental activists, government agencies, corporations, tribal groups, and many more. After decades spent at the negotiating table, she has learned that a case does not turn on facts, legal merit, or moral superiority. It turns on people. Through ten memorable stories, she shows how issues of culture, personality, history, and power affect negotiations. And she illustrates that equitable solutions depend on a healthy group dynamic. Both the mediator and opposing parties must be honest, vulnerable, open, and respectful. Easier said than done, but Moore proves that subtle shifts can break the logjam and reconcile even the most fiercely warring factions. This book should be especially appealing to anyone concerned with environmental conflicts; and also to students in environmental studies, political science, and conflict resolution, and to academics and professionals in mediation and conflict resolution fields. "An environmental and public-policy mediator, Moore has managed conflict resolution across an impressive and impassioned array of controversial subjects. Offering specific case studies from nearly a quarter century on the front lines of civic confrontations, Moore engagingly profiles the qualities required to help individuals and groups make critical choices and come to consensus, painlessly and respectfully." "...inspiring...hybrid instruction manual and memoir..."
"To read Common Ground on Hostile Turf: Stories from an Environmental Mediator is to pass many delightful hours 'being there' with Lucy Moore....It doesn't hurt that much of the turf is the spectacular terrain of New Mexico, captured beautifully in Lucy's simple, unobtrusive prose"
"follows the gratifying and sometimes frustrating twists and turns inherent in Lucy Moore's career as an environmental mediator....the stakes are high and the conflicts dramatic enough to make it thought-provoking for a general readership....Moore offers a series of stories of her own that are often riveting as they unfold." "[Common Ground on Hostile Turf is] about successes, failures, and outcomes that contain elements of both. It's about helping to build relationships of trust in order to undertake collective action to further a common purpose, but also—not incidentally—for the sake of the relationships themselves." "Alternative dispute resolution is one of the main impulses in American law today, and this is notably true in environmental law. Lucy Moore, a creative and successful mediator, takes us inside the negotiating rooms and shows how listening, respect, and opening up are not homilies—they are the sturdy foundations for building true and lasting results." "For three decades, Lucy Moore has opened my heart and mind with her stories. She brings to life those times when 'trust and respect among adversaries are possible' and offers us a path forward critical to our future. Regardless of the troubles people find themselves in, a way opens when we can tell our stories to one another—and when we listen." "Lucy Moore is an environmental mediator with decades of experience in the American Southwest and great stories to tell. In fact, storytelling is the key to her success as a professional mediator and facilitator. As she explains with great impact and poignancy, the only way to help people enmeshed in difficult resource management conflicts is to get them to share their stories. Newcomers to the field will learn invaluable lessons from Lucy's firsthand accounts." "It should be of interest to anyone concerned with environmental conflicts and students in environmental studies." "... retellings are interesting and ultimately helped her to learn increasing better methods of mediation. This accessible book is a good way to learn about conflicts involving Superfund sites or nuclear waste management." "The tales together present an intricate and complex field. The thoughtful exploration here will also serve academics and professionals in the field." Join Jason Mark and Lucy Moore for a webinar on Thursday, March 10 at 3:30 pm EST. Have humans really tamed every inch of the world? Despite more than 100 years of stewardship and protection from agencies like the National Park Service, America’s wild places are still vulnerable to commercial and residential land development. In the Grand Canyon, uranium mining and increasing rates of tourism not only threaten land and air quality, they also undermine a social balance that Native Americans and other local groups have worked hard to maintain. On March 10th, join Jason Mark, editor-in-chief of SIERRA Magazine and author of Satellites in the High Country and Lucy Moore, environmental mediator and author of Common Ground on Hostile Turf as they discuss the importance of wild places in America and how stakeholders can work together to resolve their environmental disputes. More details here. Download the free reader's guide here! Photo by Via Tsuji, used under Creative Commons licensing. Reposted from Lucy Moore's blog with permission. Last month’s post “Anglo Sisters” brought a comment I was not expecting. After taking liberties with women from Texas, I was sure I would get a response or two from that corner, but not a one. Instead I received a thought provoking message from a cousin. She and I share a great great grandmother who was Dakota and Ojibway, and she began with a question: How do you think your ancestors would feel if they knew that you were totally denying your Indian heritage? I was stunned. I would never deny that heritage. I honor and treasure it, and share it when appropriate. Did it occur to me to mention it in “Anglo Sisters”? No. That was a story about identifying with a culture that is not yours, and learning to identify with the one you were born into. I identify myself as Anglo, I was raised Anglo, I am seen as Anglo, I have had all the advantages of being Anglo. I am not hiding all the other ancestors that contributed to my particular being; they are making themselves known in ways I cannot imagine. But most of the time the fact that I have an Indian great great grandmother is not relevant. And especially here in the southwest I am hypersensitive to the danger of appearing to be part of the “wannabe” tribe, those who have a trace (or not even) of Indian blood but who “wannabe” native and masquerade as a tribal person. So, end of subject? Of course not. I continue to muse on this question of who we are, who we appear to be, and how to be honest with ourselves and others. Why did it not occur to me to mention my Indian ancestor in “Anglo Sisters”? Was I really in denial? Did I sacrifice the truth of my identity for the sake of a good story? I can defend myself on all these points, but still the questions are worth asking. I also muse on, and am amused by, the way people pick and choose their ancestors. When I was a teenager a relative told me that “we” were related to Charlemagne. I was studying world history at the time and thought that connection was pretty cool. And then I got to thinking about the enormous number of ancestors I must have – really countless if you go back 1200 years to the time of Charlemagne. How curious that one out of that multitude survives in my family lore. What about the pickpockets and the murderers, the poor and the hardworking, the ordinary and the boring? I know they are there in the thousands. And then, to further complicate things, along comes Rachel Dolezal, the white woman who has been passing as Black. She has chosen to be Black, and her commitment and passion are not to be argued with. But I can understand how offensive this is to African Americans. As a mediator working in all kinds of cross-cultural contexts, I have learned that what people want most is to be heard. They want to know that the listener cares, respects what they are saying, and maybe even empathizes. They don’t want you to become them, they want you to understand them. If you try to understand another culture by taking on the trappings – wearing the headband and beads, curling the hair and darkening the skin – it is trivializing that history and legacy, tossing aside what it really means to live that life, to carry that identity through generations. I am reminded of other wannabes, like those my husband encounters from time to time. He is a Vietnam combat vet and occasionally runs into someone of the same age group who is posing as a brother in arms. A few key questions and the person is outted as a pretender. This is very hurtful to those who earned their membership in that group legitimately and with great sacrifice. I’m sure there are many more examples, but I will let you ponder them yourself. At this point all I can say is that neither hiding your identity nor taking on that of another is a healthy option. And one more thing: we are all – or at least most of us – completely mixed up biologically, and in some cases psychologically as well. And back to my cousin. We had a dialogue on the subject and this was her conclusion in her last email. I do think that discussions are needed, about race, and racial identity. And ethnic identity, too. But I cannot bring myself to comment on anyone else’s self-identification. The world is made up of lots of “quirky” people. Some are pretty odd. And I think that kindness is the best way to approach our differences. I couldn’t agree more. Thank you, cousin. And, here is my much-loved grandpa, Nelson Honoré Boulet, whose mother was part Objibwe and Dakota and whose father was a French Canadian lumberjack. 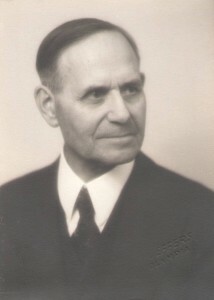 He had to drop out of school in the 6th grade but loved learning, spoke French and Norwegian, and was teaching himself Spanish when he died at 102. Reposted from Lucy Moore's blog with permission. It’s embarrassing, but one of the hardest things about being Anglo for me has been admitting it. After years living in Navajo country and more years working with Pueblos and tribes, I sometimes drift into some kind of fantasy that I am not really Anglo, that I am almost an Indian, that I am more non-White than White. Of course this is not true, and I try as quickly as possible to bring myself back to reality before I do anything that might embarrass myself and others. One memory that helps bring me back comes from Acoma Pueblo several years ago. I had a free day and decided to indulge myself and go to the traditional dances at Acoma Pueblo. I jumped in the car, zipped through Albuquerque, turned west toward Acoma, then south to the pueblo’s mesa top. I spotted it in the distance, rising hundreds of feet off the valley floor, so beautiful, so powerful. I felt very lucky to be on my way to a special ceremony in a community that would welcome me and all others who came with respect. I arrived early, parked in the lot at the bottom of the mesa and walked up the dust and sandstone path to the top. The adobe houses, the white church, the ancient cemetery, the smells of cooking, all was very comforting. I felt oddly at home. I was ready for a spiritual experience, a reprieve from the demands of my life in Santa Fe. It was 10:30 and the first dance would probably be starting soon. I walked behind the houses that ringed the dirt plaza, peeking between them to find the perfect viewing spot. I assessed the level of the sun and its direction, the location of the kiva, and other vague criteria. I found an area between two blocks of adobe houses where I would have a good view. There were a couple of dozen folding lawn chairs set up in four rows in front. I picked a spot next to one of the buildings and behind the rows of chairs. The chairs, I thought with anticipation, will be filled with elders and children, and I will be able to see what is going on in the plaza over their heads. I leaned against the wall and looked out beyond the plaza and above the roofs on the other side to the sky. It was spectacular. The clouds were puffs, huge ridiculous, snowy white puffs, bigger than they should be, so big I wondered how they could hold themselves together. Surely they were drawn by a preschooler and pasted up above the pueblo for this special day. And the color of the sky, also straight from a preschool box of crayons, was simple, gorgeous, clear blue. A perfect day for dances at Acoma, dances which promise to be a delight to the eye and ear, and an inspiration for the soul. My reverie was broken by the sound of chatter, chattering women coming across the plaza in my direction. They were not the elderly Acoma ladies I had pictured sitting in front of me; nor were they a younger generation preparing with excitement for the feast to come. They were from a tribe to the east, from Texas. They were tourists — from Dallas, I surmised — and they had targeted those empty folding chairs as prime seats. “How lucky we are to get here early,” I heard one say, “so that we could get good seats.” As they got closer I saw that the glint coming off their breasts was the sun striking their large, extra large, silver and turquoise squash blossom necklaces. They each had on a hefty concho belt as well. They were decked out and they were ready to see the dances. They settled themselves in four front row seats, and continued to talk, unaware of me behind them, leaning against the wall in the shade and blushing violently. I stared at the backs of their heads and thought critical thoughts. “How could they be so insensitive? Don’t they realize that these chairs are not for them? Don’t they know that they should be unobtrusive like me?” Pueblo members were beginning to gather and I could hear the drums from the kiva. The dance would start soon. I was certainly glad that I had nothing to do with those women from Dallas. I made sure to stand as far from them as I could so that no one mistook me for part of their clan. I assured myself that I was a different kind of Anglo, one who had lived and worked with Native people — and here I began to slip back into that fantasy — one who was really more Indian than Anglo… underneath it all. The folding chairs were filling up with Acomas, and I was getting more and more agitated about the tourists in those chairs designated for Acoma elders and children. I was torn. On the one hand I wished that the Dallas women would snap to and move themselves to some secondary position where they belonged. On the other hand, I reveled in the fact that they remained ignorant, because that made them all the more distinct from me. There could be no confusing us, them and me. They were insensitive and I was enlightened and aware. I was dying for them to get up and move, to see the light, and at the same time I was relishing the fact that they were the Anglos and that I was not. The drums were louder now, and from the posture and movement of those around me I could tell that the dancers would soon appear between the break in the houses across the plaza. Perhaps it was the beat of those drums, the anticipation, those oversized clouds, a pang of guilt — whatever it was, I had a revelation. My pettiness and judgementalism, my competition with these women for who was the most deserving outsider to be present at this very special cultural event, all these unpleasant and unworthy emotions subsided. I saw these Dallas ladies in a new light. I realized they were doing the best they could. They had no knowledge about where they were, but they had taken the trouble to get themselves up to the mesa top in time, on this special day, and they cared enough to sit in the heat of the late August sun and wait for the dance. They saw chairs and made an assumption. This was all foreign to them. At the last possible moment my conscience kicked in. After all, I knew so much more than they did. I was Anglo, and I was kidding myself to think any differently. And these tourists were Anglo, and by God, we needed to help each other out. Much to my surprise, I was flooded with affinity for them. They were my sisters! Moving in their direction, I squeezed between chairs until I was standing behind them. “Excuse me,” I whispered,” leaning over and smiling at them. “I just wanted to let you know that these chairs are always reserved for the older Acoma people and the children, so that they can have a good view of the dances. Probably you didn’t know….” Before I could finish, there was a muffled shriek in unison from the foursome, and they began to rustle in their seats, gathering purses, parasols, and water bottles. “Oh my, no! I didn’t know that! “Well, thank goodness you told us!” “How embarrassing!” “We would never want to do anything wrong!” They vacated the chairs in such a hurry that one collapsed. The last Dallas-ite turned quickly to right it, and smiled at the elder who had been sitting beside her. “I was just resting, you know. Sorry about that.” The grandma smiled back. My Anglo sisters followed me to where I was standing at the side of the building behind the chairs. With many thanks and apologies they settled in to enjoy the dance. The clouds were even puffier and more outrageous than before. The first set of dancers rounded the corner of the opposite building and appeared in the plaza. We five Anglo ladies gasped with quiet appreciation. Since the late 1980s, Lucy has worked as a mediator, facilitator, trainer and consultant, specializing in natural resource and public policy disputes. She continues to work, as Lucy Moore Associates, with a diverse group of colleagues on both regional and national cases, often with a multi-cultural or tribal component. 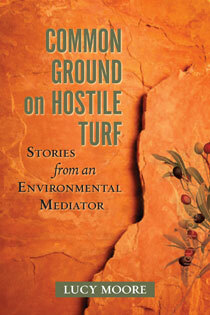 She is the author of of Common Ground on Hostile Turf: Stories from an Environmental Mediator. She has a credibility and depth of experience in Indian country rare in conflict resolution practitioners. I went to have blood drawn the other day. As I waited in the crowded waiting room, I watched the technicians open the door to the blood drawing area and call out a name. Which one will call my name, I wondered. I hope it is a good one, not one who has insomnia, is mad at a spouse, had a fender bender on the way to work, is suffering from low blood sugar and needs a candy bar. Finally my turn came. A middle-aged, cheerful woman named Maureen ushered me into the cubicle, where I sat down and rolled up a sleeve. She tied the tubing tight around my upper arm and began patting the area where she hoped for a plump vein. There were too many “hmmms” and “arrghs” for my comfort and when she finally pricked the skin and began exploring it was painful. Now, the noises were coming from me. She was full of apologies as she abandoned that site, put a bandaid on, and said she would have to try the other arm. “I’m going to let Mike do this one,” she said matter-of-factly. “Sometimes that’s just the thing to do.” I was so grateful, and gushed with appreciation. Mike whisked through the curtain with a smile. He was small, young, with hair sticking up all over his head, and black horned-rim glasses. Maureen thanked him and left to call another patient. In less than a minute Mike had performed the deed, and disappeared like a genie with three tubes of my blood. I keep thinking about Mike with gratitude, but actually I am more interested in Maureen. She admitted failure with such clarity and grace; she knew she was just not the person for this job, for whatever reason. And she knew what to do: call in someone else, maybe more experienced and skilled, to get the job done. Did she kick herself that she hadn’t been able to find that elusive vein? Was she embarrassed? Was she resentful that Mike had to come bail her out? I saw no signs, just ultimate professionalism and a realistic view of what was needed. I am particularly impressed because for me doing what Maureen did is very difficult. As an environmental and public policy mediator, I offer the ultimate in people skills. I am the one who keeps calm in the midst of turbulent emotions and high-stakes conflict. I am the one that interprets one enraged side to the other, that guides the group toward a more peaceful place, hopefully toward common ground. I have been doing this for over 25 years and am confident in my skills. In certain situations, I am sure that there is no one who could do the work better than me. But I have had my own Maureen experience. I was mediating the development of a set of regulations for a federal agency. There were tribal members in the collaborative group and with much experience in Indian country I knew this was probably one of the reasons I was hired. As we entered the last phase of drafting, I worked with the tribal members to help them document their needs. The result was a 20 page statement that included all their concerns, something I thought was useful for the group to see. But I had misjudged the impact that this would have on the agency. They were furious, felt I had betrayed them, and finally that I was not a competent mediator to let things go down this inappropriate road. In talks I realized that their trust in me was seriously shaken, and that I needed to resign and let another mediator step in. I needed to call in Mike. But I did not have Maureen’s objectivity and apparent lack of ego. I felt a flood of emotions that clouded the situation and made the transition difficult. I felt embarrassed, victimized and unjustly accused, I was insulted on the one hand, and filled with self-doubt on the other. In sum, I was a mess and it took me a while to put the experience in perspective and realize that, like in anything, there are times when you are the right one for the job and times when you are not. The reason is not important, and your ego is not the centerpiece. The process and its ultimate success are at stake, and stepping aside takes courage and humility. Photo by David Tan, used under Creative Commons licensing. Once my ten-year old son and I were in the grocery store, and we witnessed a crime. 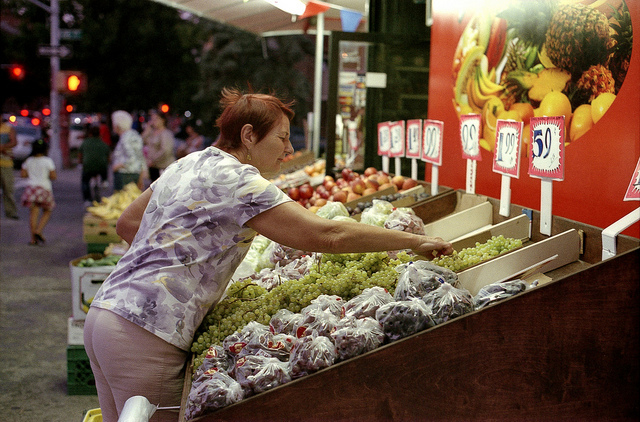 A man stood over the mounds of grapes, plucking and tasting one after another from different bunches. “What right,” I hissed to my son, “does he have to eat grapes? What if everyone did that!” I ranted all the way home, so much so that “the man who ate the grapes” became one of those family phrases that can bring a chuckle decades later. Where did that outrage come from? Like many passions it came from childhood. When I was in grade school, my mother was a graduate student in philosophy, and I learned from her about the categorical imperative. What I grasped at that impressionable age was that if you are thinking about doing something, you should imagine that everyone around you, even everyone on earth, will do the same thing. Because if you have the right to do it, then, of course, so does everyone else. I immediately saw that I should not throw my gum wrapper out the car window. If everyone did that the air would be thick, the ground covered, with foil and paper. And, if everyone acted like the man who ate the grapes, we would be left with a pile of stems, right? Photo by Derek Key, used under Creative Commons licensing. Another passion that has guided my choices as an adult came from my father. From him I gained a deep appreciation for the democratic process. He was an enthusiastic, if not always successful, politician in my early years. He loved the race and was passionate about his underdog causes. I learned from him the joys of participating in the system, imperfect as it may be. The concept of democracy, where ideally each person has an equal voice, moves me deeply; I confess to even tearing up in the voting booth when I think about it. If we all took each vote that seriously, thinking about our needs, the needs of others, the greater good — and the categorical imperative — wow, it could be an amazing world! Now I find myself all grown up, a professional mediator, and I see that these values instilled by my parents are core to what I do and why. My cases are complex conflicts over the use of natural resources and protection of the environment. My first and most important job is to get the right people at the table to find a solution. I am insistent that every interest with a stake in the outcome be represented. Each of those voices has a right to participate, to have a say in that ultimate solution. Of course it would be easier in many cases if the troublemakers, the obstructionists or the little guys were left out. Then the powerful players could cut a deal “on behalf of everyone.” But that strategy offends me deeply. To resolve the most difficult conflicts we face requires us all to take part, get educated, speak up, and above all to listen to other voices. 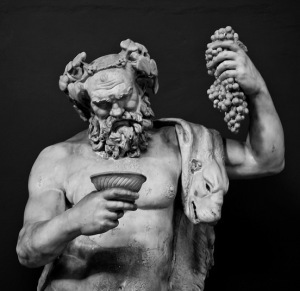 To approach these problems like the self-absorbed man who ate the grapes will not do. I welcome your thoughts and stories about the origins of your passions and values. And by the way, you can still be my friend if you have sampled grapes at the grocery store. I am working on my tolerance. 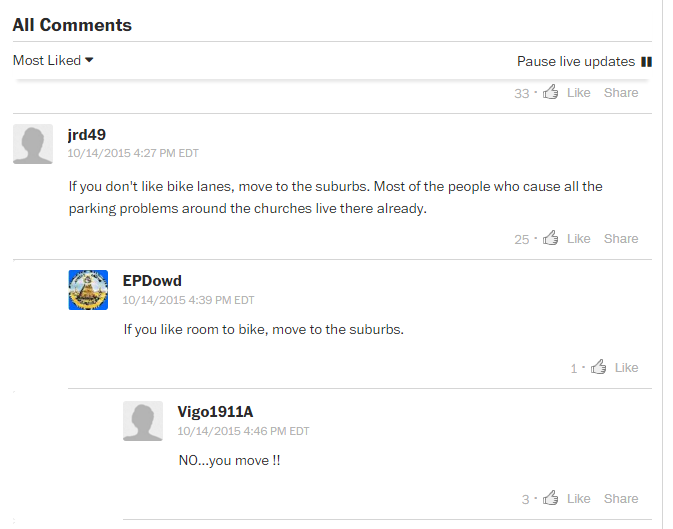 I just read the article on the controversy over proposed bike lanes east of downtown Washington, D.C. It was kind of heavy going as I tried to sort out the different proposals illustrated in the many graphics. I really studied them, thinking that there must be some that would be acceptable, or could be modified to meet all needs. What a naïve mediator I am! I thought the conflict was about bike safety and parking needs, a conflict over land use and what priorities prevail in a congested area. Then I dipped into the online comments and realized how completely off-track I was. The church may have made a poor choice in claiming that the constitutional right to freedom of religion somehow includes the right to park, because this really set readers off. The primary issue, according to dozens of online pundits, is taxation. Churches don’t pay taxes, to paraphrase, and therefore don’t have a right to tell the City what to do. This then spun into wild arguments about who pays taxes and what rights ensue, culminating, for me, with “pedestrians don’t pay taxes, let’s rip up the sidewalks.” It was all quite entertaining on one level, but on another level it was depressing. Commenters spewed venom against this particular church, and religion in general. Why couldn’t the church members walk a few blocks? Why didn’t they ride their bicycles to church? What made them so special? Why didn’t they stay home in Maryland and pray? What use are churches anyway? And lots more. And of course they insulted each other and seemed to be competing for the bullying prize. Mediators have a mantra: be hard on the problem, not on the people. In other words, tackle the issues with energy and ferocity, but treat each other with respect. How quickly that chorus of virtual commenters leapt at the people and completely ignored the problem. So, the Bundys are at it again. Two years ago Cliven Bundy and his gang took up arms against the Bureau of Land Management in Nevada claiming the feds had no right to charge a private citizen grazing fees on public lands. “Public” apparently means “help yourself” in their dictionary. I don’t know if Cliven considers that stand-off a success, but he got a ton of publicity, and my understanding is that his cattle are still grazing – or trespassing, depending on your point of view – on federal land. The conflict lives on in court, where it has been for a couple of decades. Ammon Bundy; Photo credit: KOIN/LIN Television Corporation. And now Ammon and Ryan Bundy, Cliven’s sons, have rounded up their own posse and gone to southeast Oregon to support another ranching family, the Hammonds, who are facing jail time for arson on federal land. At this moment they are occupying the Malheur National Wildlife Refuge building and the Fish and Wildlife Service has closed its offices in the area. Schools are also closed for the week. There is plenty to be concerned about. Again they are armed. Again they are full of tough talk about staying til justice is done. Again they are hearing the “word of God,” exhorting them to break the law on this piece of land that is not theirs. They are ready to die if it comes to that. These are elements of many of the worst conflicts in the world today, and these are the elements that make my mediator’s heart sink. But, wait, a ray of light! The local community, including the Hammonds, are rejecting the uninvited support. Their public statements include: “They don’t speak for us,” “We don't need outsiders telling us what to do," “We are a law-abiding community,” “Bundys are here for their own gain, at our expense.” Even Susan Hammond, wife of the soon-to-be imprisoned Mr. Hammond, said "I don't really know the purpose of the guys who are out there.” Most seem to want the uninvited supporters, now calling themselves Citizens for Constitutional Freedom, to go back where they came from. As an environmental mediator I have dealt with dozens of nasty conflicts over the use and management of natural resources. (And, no, I do not want to go to Oregon.) What I have learned is that there is a powerful bond between people and their land. If it is your land, by birth, by deed, by heritage or culture, your stake is greater than any other interested party. If you are a tribe, for instance, or a traditional rural community, and your people have been in a certain place for centuries, you have a powerful card to play at the negotiating table. If those resources are the foundation for your livelihood, your identity, your beliefs and values, then you are not going anywhere. You are staying put, and you will be cautious – not necessarily hostile – but cautious about those who want to share in those resources, who want to join you in your homeland. This is the source of the deep conflict in the southwest between land-based traditional communities and newly arrived environmentalists, who with the best intentions invite themselves in, full of ideas for a better way of doing things. Aside from whether the new ideas are good ones or not, the approach and the assumptions can be inappropriate at best, and insulting at worst. The environmentalists may be confused and hurt by the reception, and may choose to dig in and fight, or may leave for greener pastures where they will be appreciated. In New Mexico a conflict between environmentalists and a traditional sheep-grower’s cooperative was resolved through mediation, but the process was a difficult one for all involved. The environmentalists who opposed the coop’s grazing their sheep grazing in a wildlife refuge had to learn about the culture and history of the land and develop respect for the particular link between the community and the land. The sheep growers had to come to the table and negotiate, something they were in the beginning unwilling to do. And so, Citizens for Constitutional Freedom, do you see the parallel? Those local folks have power based on their sense of community and their attachment to that piece of land. 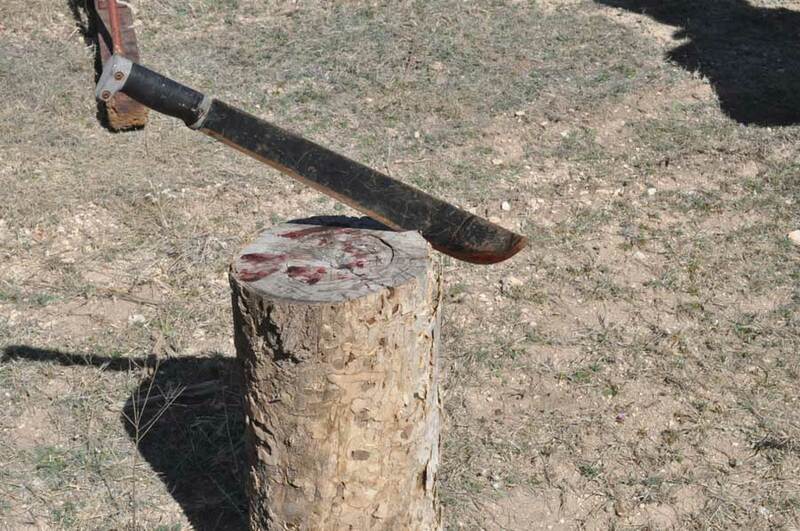 The battle with the Fish and Wildlife Service is theirs to fight, with the tools they choose. You have arrived uninvited and are being politely asked to leave. I would suggest you do so ASAP. And to the federal government, I say smart move. Shut down and wait it out. Let those with the real power, those on the land, handle this invasion. They are the best equipped and have the moral authority to defend themselves. Did you catch Lucy Moore's blog post about the Bundy brothers last week? Since the late 1980s, Lucy has worked as a mediator, facilitator, trainer and consultant, specializing in natural resource and public policy disputes. In her book, Common Ground on Hostile Turf, she shares the most compelling stories of her career, offering insight and inspiration to anyone caught in a seemingly hopeless dispute. Through ten memorable stories, she shows how issues of culture, personality, history, and power affect negotiations. And she illustrates that equitable solutions depend on a healthy group dynamic. Both the mediator and opposing parties must be honest, vulnerable, open, and respectful. Easier said than done, but Moore proves that subtle shifts can break the logjam and reconcile even the most fiercely warring factions. Check out Chapter 5, "Finding Common Ground," below. Despite more than 100 years of stewardship and protection from agencies like the National Park Service, America’s wild places are still vulnerable to commercial and residential land development. In the Grand Canyon, uranium mining and increasing rates of tourism not only threaten land and air quality, they also undermine a social balance that Native Americans and other local groups have worked hard to maintain. 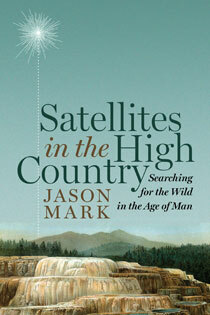 On March 10, Satellites in the High Country author Jason Mark and Common Ground on Hostile Turf author Lucy Moore will come together for a free webinar as they discuss the importance of wild places in America and how stakeholders can work together to resolve their environmental disputes. To learn more about these issues, we asked Lucy about the role of environmental mediation in conversations surrounding wild places. Check out her answers below and register for the webinar for free here. Can you provide context for some of the proposals and controversies currently surrounding the Grand Canyon? What plans are there to involve the public in discussions surrounding these situations? The two controversial development proposals at Grand Canyon are on different tracks, given the different jurisdictions and legal frameworks. The future of the Navajo Escalade Project, proposing to build a major resort on the edge of the canyon with a tram to the confluence of the Colorado and Little Colorado Rivers, seems to depend on the political preferences of those in power. The current Navajo Nation president Russell Begaye opposes the project and has put it on hold indefinitely. Whether or not it survives and is viable is up to the tribal council and the Navajo citizens it represents. The second controversy involves the major housing and shopping center development at Tusayan, the small town adjacent to the National Park. Tusayan would like to be able to offer housing and services to its own residents and to the hundreds of Park employees who are currently in mobile homes within the Park, cramped and with no hope of home ownership. Proponents of the development claim that it would relieve pressure on the Park and allow the town to become a badly needed commercial center in the area. Opponents are concerned about the size of the development and its impact on groundwater, air and other environmental resources. 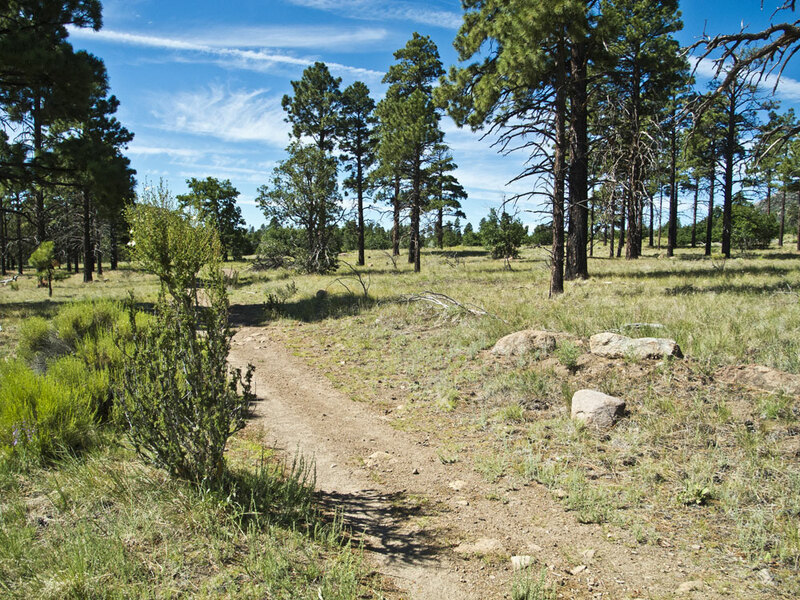 Because the development requires road easements from the neighboring Kaibab National Forest, this proposal is wending its way through a federal decision-making process, the environmental impact assessment. As an environmental mediator, it’s always a difficult question to know when and how to weave the public into a formal mediation process. I believe strongly that the public has a right to know who is at the table, who they represent, what the goals are and when they can have their say. A challenge is in the definition of the public. Should local residents be given priority? What about those from elsewhere who have an interest in the proposal, either pro or con? I find it a strong argument that if you live and work on the land your “stake” in the outcome is greater than the environmental organization executive director who flies in from the coast to testify. But we can all think of examples where local control is not in the best interest of the long-term health of the resource or the community, and outside voices are needed. Keeping a balance, and maintaining respect, is tricky indeed. The federal process at Tusayan, cumbersome and time-consuming as it is, does require public involvement and a comment period at different points. How seriously those comments are taken and how they are weighed is always a worry for advocates. Does the number of comments on one side or another matter? Is anyone who counts really reading my comment? Is the decision already a done deal? When I am managing the public meetings prior to these comment periods I make sure that the decision-makers are there, that they are paying attention, are responsive to questions, and are respectful. That’s all I can do. I don’t know if there are requirements for public involvement in the Navajo decision-making system, but I am sure that the grassroots citizens have ways of making their wishes known. And, also, outside interests advocating for environmental and cultural protection, or economic development, are certainly ready to become involved if there is an opportunity to influence the decision. Mohave County Supervisor Buster Johnson has suggested that uranium mining in his county could be worth $29 million. Could you share some of your experiences in environmental mediation that involve the balance between economic development and environmental quality? Finding that balance can be impossible. Sometimes there are ways to modify a project so that it provides some economic benefit and offers some environmental protection. But for major projects, like a uranium mine, it will be difficult to negotiate a “smaller” mine. The developer will have needs of scale to make a profit; the opponents will see any mine as unacceptable. I have an example from many years ago that sticks with me as a valiant effort to meet the economic and preservation needs of a region. I hang onto it, I think, because it is a rare example of someone who could see both sides and find a creative step to take. The Mexican Gray Wolf is an endangered species that has been reintroduced by the US Fish and Wildlife Service in southwestern New Mexico and southeastern Arizona. The wolves are raised with minimal human contact and under strict protocols that prepare them to behave in the wild mountains of this region as they once did. Ranchers and small-town folk in the region have opposed the program from the beginning, and over the years some have killed wolves with a variety of motives: protection of cattle, fear for their own safety, or general resentment of feds butting into their business. The USFWS educated communities as best they could and offered compensation for cattle killed by wolves, but the killings continued. Kevin Bixby is the founder and executive director of the Southwest Environment Center, based in Las Cruces in southern New Mexico. Distressed with the standoff and the decreasing population he also was able to see the ranchers’ point of view. Rather than take them head on and tell them they were wrong, uneducated, unenlightened and heartless people, he came up with an idea to meet both sets of needs. He designed (and I facilitated) a workshop in the heart of the reintroduction area for ranchers to hear from local residents in the Yellowstone area, where wolves were introduced a few years earlier. They described their struggle with the wolves, their fears and resentments, matching their audience perfectly. And then they talked about how they turned the situation around into a money-making venture, a much more profitable one, they said, than the ranching and outfitting they had been doing. They were offering to well-heeled eco-tourists an experience in wolf country that included going into areas on horseback, camping overnight, listening to wolves calling, hearing local legend and history of the area, learning the truth about wolves and their habits. The local New Mexico ranchers were intrigued, had lots of questions and stayed after the workshop ended to talk more to these compadres from another region. They took brochures, asked for phone numbers, and said they were interested in pursuing the idea. I don’t know if anything came of it, but I do know that Kevin took a bold step in reaching out to that community – the traditional enemy of the environmentalist – and putting himself in their shoes. Thinking “what can I do to help these people whose needs are real?” is a rarity among advocates on any side. I thank Kevin for that moment of inspiration. In your book you mention that the Native American community is often – and with good reason – reluctant to align with the federal government, even when the goal is the protection of their land and sacred sites. Can you talk more about the challenges surrounding federal-tribal relationships? The federal-tribal relationship adds a layer of complexity to any conflict where a tribe, or tribes, and a federal agency, or agencies, are involved. 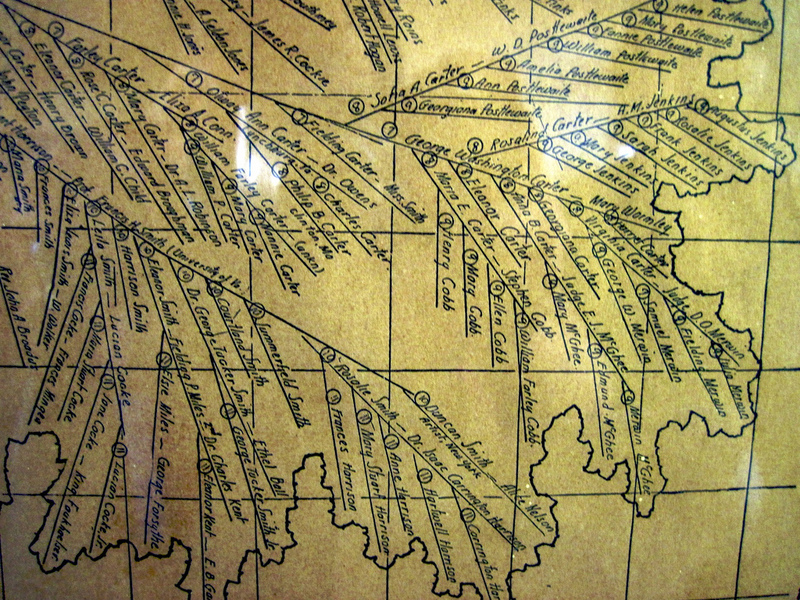 Part of that complexity derives from their painful common history. It is difficult for tribal representatives at the table to forget about those travesties when they are sitting across from people working for that same federal government that perpetrated those crimes. The fact that it happened 150 years ago means nothing when it comes to matters of the heart. And it is painful in another way for the federal representatives to have to confront this history. No matter that they were not born until many decades after the atrocities; guilt has no expiration date. Another part of the complexity comes from the inherent conflict of interest for the federal government. They have a trust responsibility to all federally recognized tribes to defend and represent those interests. At the same time, an agency like the Bureau of Reclamation may propose to build a dam that will prevent seasonal spawning for fish critical to the tribe’s economy and/or culture. Lawyers for the Department of Interior, which houses Reclamation, the National Park Service, Bureau of Indian Affairs, Fish and Wildlife Service, and many others, find themselves in conflict, bound to represent both the interests of the bureau and the trust responsibility to tribes. Tribes often feel in these cases that their interests are sacrificed for those of the non-Indian world. This is an artifact of federal law that is not within my purview as mediator to resolve. What I can do is help tribes air their anxieties, help feds listen and respond, and focus on the issues at hand and a resolution that is satisfactory to all. And finally, for me it is all about the relationship. If individuals can appreciate each other and see the humanity in each other, we have a chance at a good solution. Want to hear more? Don't forget to register for the webinar this Thursday and enter for the chance to win a 5-day adventure with Jason Mark in Flagstaff, Arizona to learn more about the threats to the Canyon and explore its surrounding wildlands. We asked our authors: In today's age of slacktivism, has Earth Day become meaningless as a way to make impactful environmental change? Check out what Lucy Moore, author of Common Ground on Hostile Turf, had to say below. Those choosing social media and digital activism have become known as slacktivists, the armchair activists who participate in the world by signing online petitions, “liking” on Facebook, “sharing” with all your connections, maybe sending money. The term can also include those of us who sport bumper stickers, wristbands and T-shirts with messages, and buy from socially conscious companies like Ben and Jerry’s and Paul Newman. Critics would say that these are all ways of pacifying our consciences, assuaging guilt and kidding ourselves that we are making a difference. Real activism, they say, means educating yourself, choosing your cause wisely, committing your time, energy and other support to the effort, joining with others in protests or actions that have an impact and maybe include risk. I have a friend in his 80s who right now is at Creech Air Force Base protesting the use of drones that wage remote warfare, often with disastrous consequences for innocent people. He will likely be arrested. I admire him immensely and I think his form of activism is the best, the gold standard. 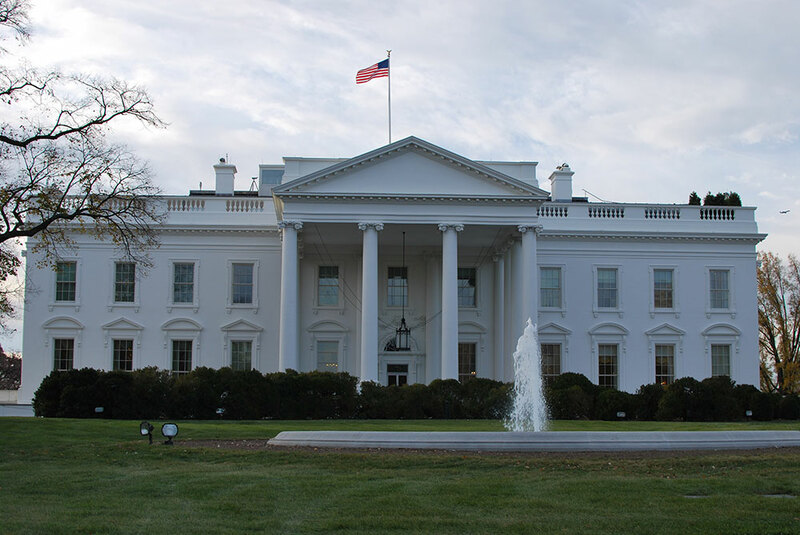 We the People allows users to create, share, and collect signatures for petitions online. I can’t see that it causes any harm, and there are examples – Amnesty International, for instance—huge numbers signatures have had an impact. In repressive countries, social media, tweeting, and its equivalents are actually very active steps to take. The Arab Spring movement was born in a million clicks. And here at home, Bernie Sanders has millions of people clicking monthly to send him $27, creating a campaign chest that represents enormous power. There is real power in that armchair, recliner, bar stool or whatever. The record was broken this year for the number of pounds of rattlesnakes harvested at the annual Rattlesnake Roundup in Sweetwater, Texas. I was blown away. The figure was 24,262 pounds. The favored hunting technique is spraying gasoline into their holes to drive them out to slaughter. The roundup includes a lot of other activities, like a Miss Snake Charmer contest, a gun show, a cook off, and special events for kids, who are admitted free if they’re under 12. And to be fair, Texas is not the only state with such an attitude. We in New Mexico have the Annual Coyote Hunt, based on the same premise that this threat to man and cows must be reduced by any means possible. Every state may be able to tout its own particular assault on wildlife. There are opponents to the rattlesnake roundup who speak eloquently about the damage to the environment and other species as a result of the gasoline application. And there are a few brave souls who speak on behalf of this species’ right to a piece of this planet and claim that its threat to man and cattle is greatly exaggerated. Apparently there were only five deaths due to rattlesnake bites in the past year in the U.S. and no recorded cattle deaths in recent history. They point to educational no-kill roundups that bring even more tourist dollars and offer plenty of excitement. 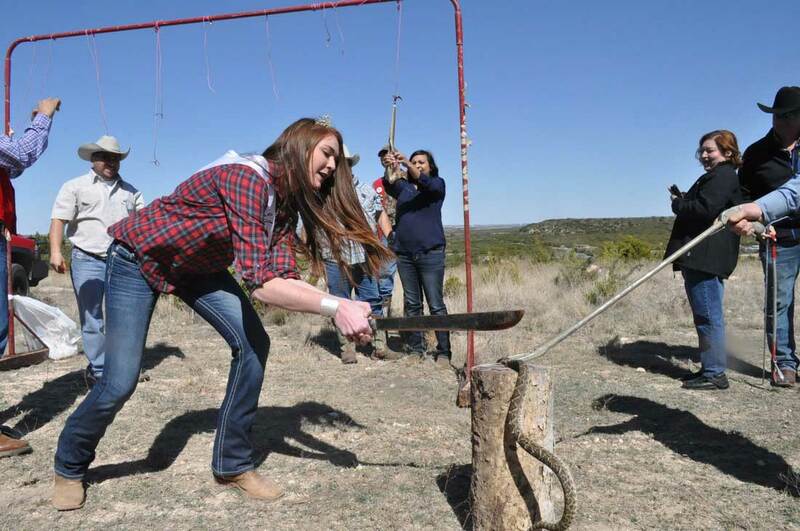 There are studies underway to explore changes in state law that would ban the Sweetwater-style rattlesnake roundup, but opponents to change are fiercely loyal to their traditions. As a mediator, I am not tempted to volunteer my services in Sweetwater and take on the rattlesnake roundup controversy. We are taught to be careful of our own bias when helping those in conflict to find a solution. And if that bias exists to a degree that impairs your ability to be a neutral mediator, you should not take the job. So, what’s my bias that prevents me from jumping in to help find this common ground? To confess, I really don’t like snakes—of any kind (see my blog for more on that). The idea that a snake is harmless just doesn’t register with me, in that any snake will scare me half to death, and I consider that harmful to my health. But much as I never want to see another snake, my bias is in their favor. Every creature needs a place to call its own; every creature has the right to pursue its version of happiness. And we humans should stay out of the way if possible. There are encounters that can be disastrous. The two-year old and the alligator in Florida, the four-year old who fell into the Gorilla’s enclosure at a zoo. Sometimes the human is the loser, sometimes the animal. And here in New Mexico a woman who fell behind in a marathon in a mountainous area came around the bend and frightened a bear cub up a tree. The mother bear was alarmed and attacked the woman, clawing her arms and neck. The woman wisely fell to the ground and stayed there motionless and after a few minutes of snorting, the mother bear departed, cub in tow. The woman was rescued, her wounds were not life threatening and she was released from the hospital the next day. Meanwhile the state Game and Fish Department had mobilized, tracked down the bear and killed it, thereby orphaning two bear cubs. The woman is now lobbying to change New Mexico state law that currently mandates that any bear that attacks a human must be killed, decapitated and tested for rabies. I admire her immensely and will support her efforts, choosing to work as an advocate in this case. And back to the rattlesnake roundup. I hope that the folks in Texas can figure this one out, and from what I have read, they are at least exploring options. It may be hard to convince the Sweetwater crowd to shift their emphasis to education and drop the gasoline and slaughter. But, maybe neighboring communities that have gone before and made the shift can help. Maybe some will seek to change state law, as the mauled marathoner is doing. I do believe there is common ground there and that it is possible to continue the tradition in a more humane format. I wish them well. A few months ago I wrote a post about the occupation of the Malheur Wildlife Refuge building in Oregon by the Bundy brothers gang. They had come to the rescue (in their opinion) of locals who had been convicted of burning forest land. They saw these rural Oregonians as fellow victims of the federal lands policies—policies that deny them free use of public lands. They were not welcomed by most locals who preferred to handle the situation in their own way and resented the outsiders capitalizing on their site specific conflict. 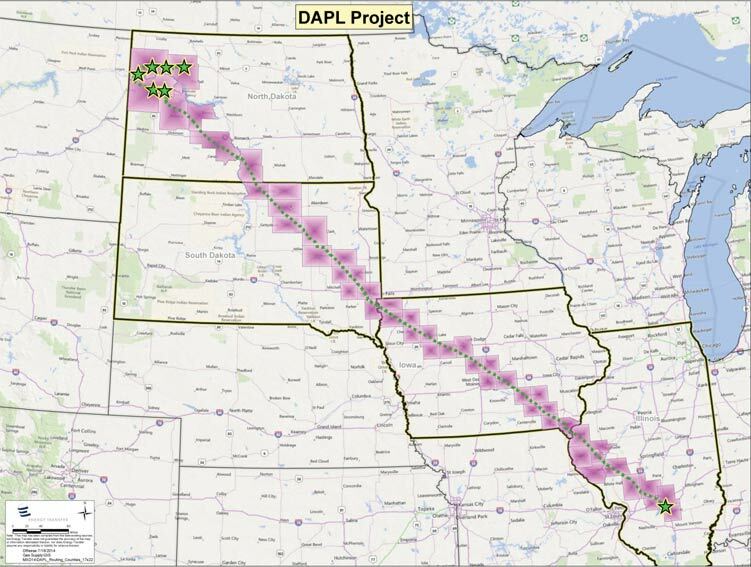 The Standing Rock Sioux in North Dakota have drawn thousands of sympathizers, Indian and non-Indian, from all over the country, who are encamped near the site of a proposed pipeline that would cross under the Missouri River just upstream of the reservation. They are protesting with the tribe against the pipeline company and what they see as the complicity of federal agencies. Non-Indian residents in the area are concerned for their property, and some are frightened by the mere presence of thousands of Indians so close by. But the tribal leadership expresses gratitude for the support that they feel will help draw attention to the injustice of the situation. So, is this the same scenario—Malheur and North Dakota? I would argue that the stakes are different, that this is an issue of tribal sovereignty, not an individual citizen complaint against the feds. This is about US history, treaties, court cases, and policies that define the unique government-to-government relationship between tribes and the federal government. Standing Rock is calling for scrutiny of this relationship and a recognition of abuses in the past as well as the present. This is an objective shared by every federally recognized tribe across the country. The encampment at Standing Rock has galvanized tribal voices into a powerful protest. Many feel they are reclaiming a cultural identity and finding a new unity among tribal people which they hope to maintain and nurture. But the two situations share one important reality. When all the commotion is over, the locals—in this case the tribe and their non-Indian neighbors —will need to resume the task of living side by side. As Standing Rock Sioux chairman David Archambault II reflected “I have to live here when everybody’s gone.” Public officials quoted in the recent New York Times article have started to talk about their hopes of a “peaceful endgame.” And a county commissioner summed up the future: “When this is all over, we’re still friends and neighbors.” The protest has empowered and emboldened Standing Rock, but it has also put yet another strain on local relationships. Perhaps coming from a place of greater strength, the tribe will be able to forge stronger relationships with their neighbors. After all, they share a deep love of the land and caring for their communities. All they have to do is reach across those fences with respect and a desire to be good neighbors. I wish them luck. As a mediator, I am always interested in unlikely bedfellows snuggling up to solve a problem, particularly in cases where there is no mediator, no third party to make the bed and tuck them in. These bold hookups, generated by the parties themselves, can result in creative solutions that one side or the other would have never considered but that end up meeting the needs of both. 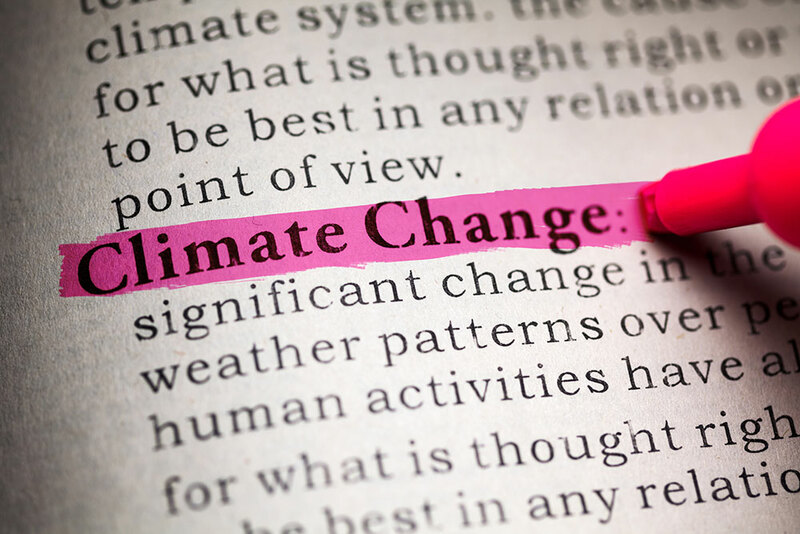 So, I read with great interest about a group of college Republicans and Democrats and environmental organizations that have come together (without a mediator) to tackle the mega-issue of carbon emissions and climate change. Of course people come together to resolve disputes all the time—in the workplace (staff meetings), at home (kitchen table), at play (TV room, ESPN v. Netflix), to name a few. I deal with the bigger, public issues, like water rights, air pollution, waste disposal, public land management, etc. For these complex, multi-party issues a mediator is usually front and center to help get the right people to the table, clarify the goal, establish a timeline, set a respectful and collaborative tone, and all the other services we see as critical to successful resolution of the conflict. So what brought these adversaries together, what common ground did they identify that held the hope of a mutually supported solution? I read the article carefully and the link to the Baker-Schultz legislation to tax carbon emitters for clues. 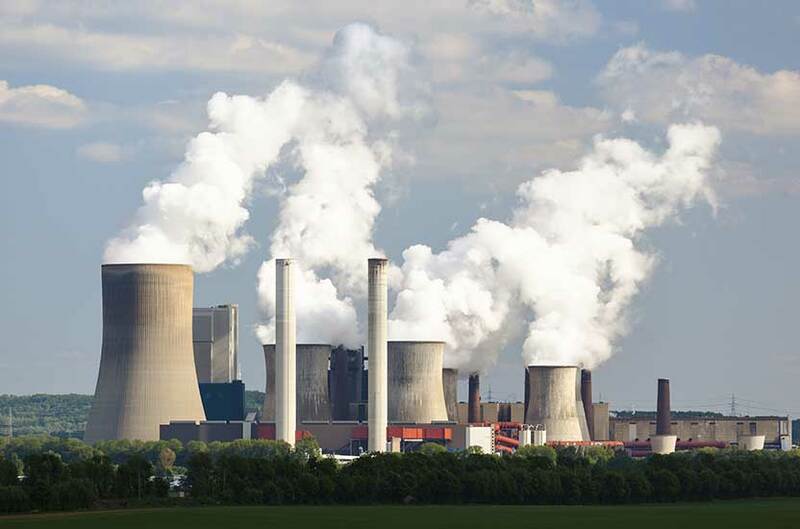 Industries that produce carbon emissions will have a choice: either reduce emissions to a certain level, or pay a tax, which would gradually increase over time. The tax that is collected from the emitters would be returned to the American people in dividend checks administered by the Social Security Administration. A family of four is estimated to receive $ 2,000 in the first year. The bill is silent on who pays the tax, but I imagine the industry passes it on to the consumer, so we do. I may have missed something, and would welcome being educated, but this is how it looks to me. A company will weigh its options: which will cost me more—to reduce emissions or pay the tax? If it costs less to pay the tax, then the emissions remain at the same polluting level. There is no benefit to the environment. But the American public is happy with money in their pocket to spend, perhaps on a new carbon-emitting product. The more the taxes go up, the more money comes back to us, and the smokestacks keep belching. At some point I would hope that the tax would get high enough so that producers would choose to spend money on reducing emissions rather than being taxed. But I return to my initial curiosity about these diverse interests—young Republicans, Democrats, and environmental groups—getting together to support the Baker-Schultz proposal. Forgive my dark conclusion: getting more money in our pockets is the common ground, the one “good” that we can all agree on. It reminds me of the recent tax reduction legislation that blinded us to any thoughtful analysis with the promise of an immediate increase in paychecks. Apparently, the quicker that money can reach us—no matter the amount, no matter the long term consequences—the happier we will be. Are we so shallow, so short-sighted, so greedy for immediate gratification that we cannot entertain the greater good that would come from reduced emissions, or a host of other benefits from a more thoughtful, socially responsible use of money? As a citizen, I am confused and depressed by the message I take from this example. But as a mediator, I congratulate these adversaries for reaching across the boundaries that separate them. I believe that this instinct is a noble one and that, aside whether an agreement is reached, real benefits accrue. Those who may have demonized each other now have a better understanding of the “other.” They may even leave with meaningful relationships that can serve them in the next encounter. These are good things.